It’s nearly Anzac day, so in honour of my brother Stu – who ditched English drizzle and lives in South Australia – I rustled up a batch of Anzac biscuits. These come from one of the first cookbooks I ever bought, Bill Granger’s Sydney Food. I remember quite clearly, as a student (and therefore skint) going to Habitat in Nottingham to buy a birthday gift – a wok – for my housemate Viv and getting distracted by a pretty book. This was 15 years ago and Bill Granger was not famous then. He offered a sophisticated lure of waterside cafes, fusion sunshine food and farmer’s markets, which was a far cry from the East Midlands at the turn of the Millennium. Plus it had lines such as, “For an old fashioned Sydney experience you’d use mulberries from the tree that always stained your mother’s washing on a windy day – and get your fingers and lips red in the picking. The blueberry is more urbane.” I love this. My mind blown, I forked out the 15 quid and got a little deeper into debt. Preheat oven to 160c and line two baking sheets with parchment. Mix flour, coconut, sugar and oats in a bowl, making sure you get rid of any sugary lumps. Melt together butter and syrup in a pan. Mix the bicarb with boiling water and add to the melted butter. Now add the butter mixture to your dry ingredients and stir it all together. You should have an easily workable dough. Place balls of dough onto the baking trays and flatten. They will spread so leave room – more than I did (see pictures below). Bake for 15 mins until golden brown. They should be a bit chewy so don’t overcook them. Leave to harden on the trays for five minutes or so, then transfer to a wire tray to cool completely. After baking. Leave room for expansion! I am sure it’s not traditional but these would be great flavoured with a little ginger, and a drizzle of chocolate on the top wouldn’t go amiss either. Anzac biscuits taste better than they look, particularly if they are allowed to spread into a proper circle. 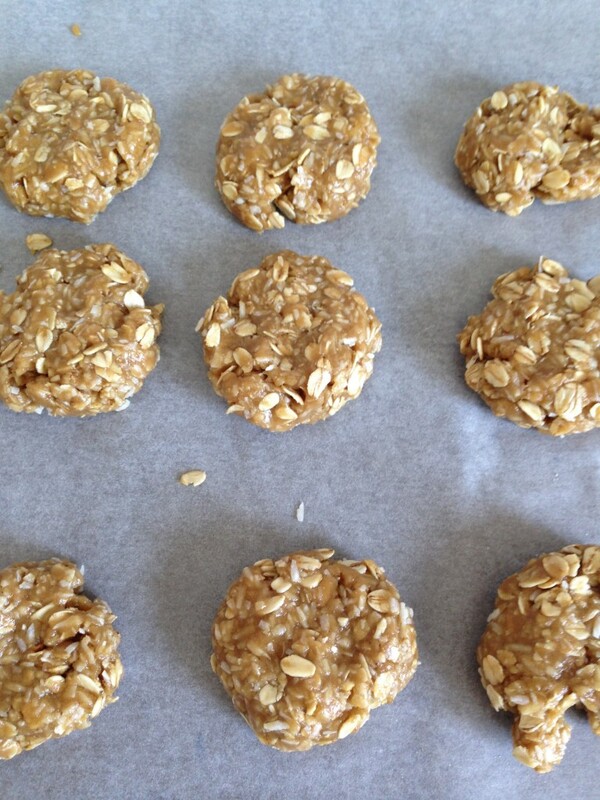 They are oaty and chewy, sturdy enough for lunchboxes (and I’ve been known to eat them for breakfast). 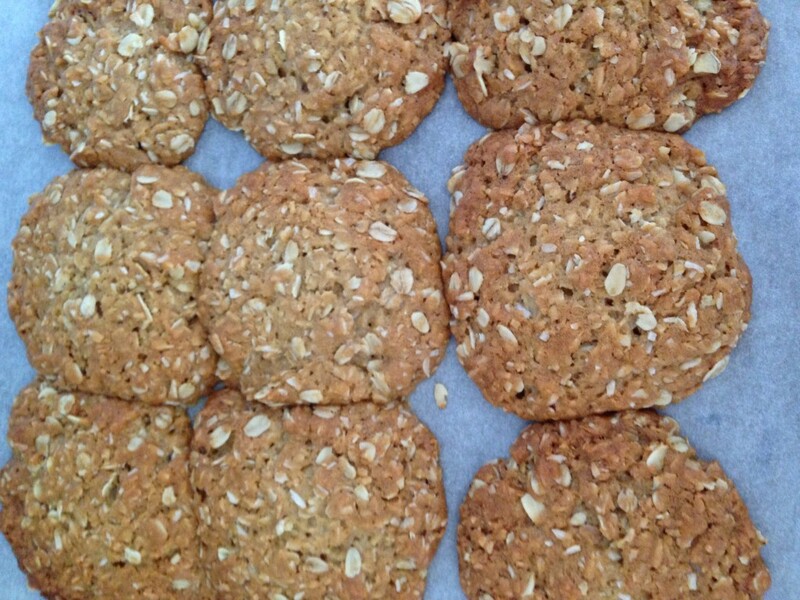 This entry was posted in Recipes, Sweet and tagged anzac biscuits, Bill Granger, Sydney Food. Bookmark the permalink.